Cook pasta in a large saucepan of salted boiling water following packet directions or until al dente. Drain well. Meanwhile, combine the tomato, green shallot, lemon thyme, lemon juice and oil in a large bowl. Taste and season with salt and pepper. Add the pasta to the tomato mixture and gently toss until just combined. Add the tuna and feta and gently toss to combine. 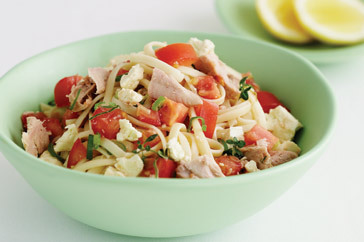 Divide pasta among serving bowls and serve immediately with lemon wedges.